Holland America Line’s popular Explore4 promotion is back with four alluring offers on more than 600 March 2018 through April 2019 cruises. 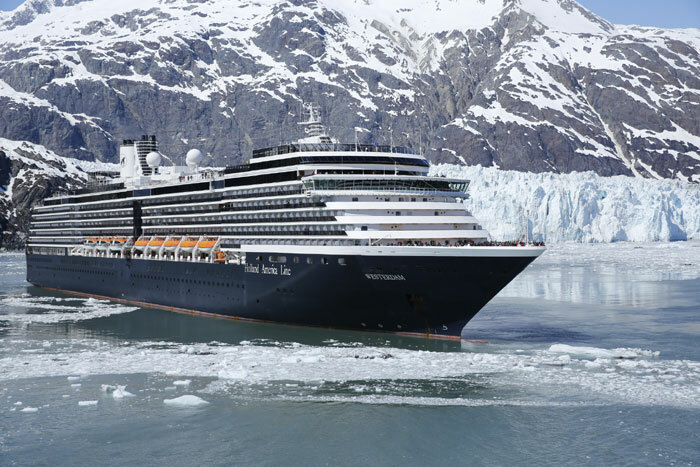 Travelers looking to book a cruise or Alaska Land+Sea Journey for next year or beyond can take advantage of all the benefits, which include complimentary beverages and specialty dining aboard ship as well as reduced deposits and free or reduced fares for friends and family. Suite bookings also receive onboard spending money. The Explore4 promotion for guests booking any category stateroom includes a Signature Beverage Package valued at $1,400 per stateroom (based on a 14-day cruise), dinner at the Pinnacle Grill for two, free or reduced cruise fares for friends and kids in the same stateroom, and 50 percent reduced deposits. Guests receive all benefits, and bookings must be made by Nov. 17, 2017. Guests who book a cruise in a suite category stateroom will receive the four offers plus an additional $200 onboard spending money per stateroom ($100 per person). Guests who book any category stateroom receive a Signature Beverage Package that includes wine, beer, spirits, cocktails, sodas and coffee. The beverage offer is only applicable on the cruise portion of Alaska Land+Sea Journeys. Explore4 offers also include a complimentary dinner at the award-winning Pinnacle Grill, an alternative restaurant known for serving delectable Pacific Northwest favorites with the freshest, richest flavors. Featuring a tantalizing menu highlighting steak and seafood dishes like filet mignon and broiled Alaska king salmon, Pinnacle Grill also includes favorites like roasted pumpkin risotto and double-cut Kurobata pork chops. With reduced cruise fares on select sailings for friends and kids sharing a stateroom with two other guests, a group of four can take an affordable vacation to the Caribbean or a longer journey to an exotic destination. For example, in the Caribbean, fares for seven-day cruises start from US$799 for the first and second guests in an interior stateroom, and free or reduced fares apply for the third and fourth guests. A seven-day European cruise starts at US$1,199 for an interior stateroom for the first and second guests, with free or reduced fares for third and fourth guests. Taxes, fees and port expenses are additional. By taking advantage of the 50 percent reduced deposit offer, guests will have more flexibility and time before paying the final deposit on their cruise. Guests looking to take advantage of the Explore4 program can choose select itineraries to nearly all of Holland America Line’s global destinations, including Alaska and Alaska and the Yukon Land+Sea Journeys, Asia, Australia/New Zealand, the Baltic, Bermuda, Canada and New England, the Caribbean, Europe, Hawaii, the Mediterranean, Mexico, the Panama Canal and South America. Grand Voyages and Grand Voyage segments are excluded.